with the use of significantly more reagents or more complex pre-treatment processes. 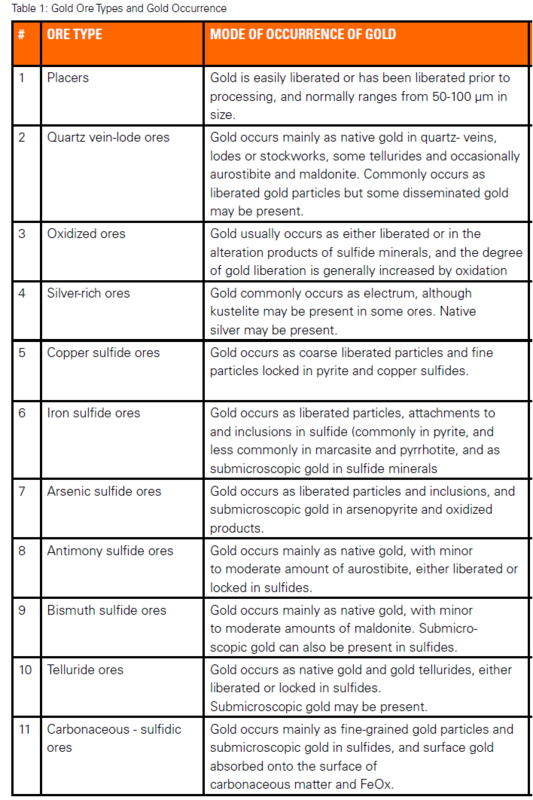 Based on the mineralogical characteristics and mineral processing techniques required, gold ores can be classified into 11 types (Table 1). Some metallurgical implications to these gold ore types are summarised below: Placers, quartz vein gold ores and oxidized ores: Generally, placers, quartz vein gold ores and oxidized ores are free-milling and gold can be recovered by gravity and/or direct cyanide leaching. Some epithermal deposits may be free-milling (such as the oxidized portion) but more commonly contain significant amounts of sulfides in which gold occurs as tiny inclusions or submicroscopic gold and are therefore refractory. Silver-rich ores and copper sulfide ores: Silver-rich ores and copper sulfide ores are often free-milling, but when the silver grade is high (>10 g/t) and/or the gold is present as electrum, the processing may need to be modified. The greater reactivity of silver can influence the behaviour of gold in flotation, leaching and/or recovery processes. Electrum with a high silver content may give poor gold extraction due to tarnishing of the silver (Fleming,1998). The presence of copper in the ore at above ±0.3% concentration may make direct cyanidation uneconomic without re-treating the Cu(CN)2 formed in leaching, through processes such as SART and Hannah. Iron sulfide ores and arsenic sulfide ores: Iron sulfide ores and arsenic sulfide ores host different proportions of non-refractory and refractory gold. Gold in non-refractory sulfide ores can be recovered by whole-ore cyanidation, or some combination of flotation and cyanidation. Acceptable extraction of refractory gold can only be achieved by employing a pre-oxidation process prior to cyanide leaching. Antimony, bismuth sulfide and telluride gold ores: Antimony, bismuth sulfide and telluride gold ores are often somewhat refractory due to the presence of slow-dissolving gold minerals such as aurostibite, maldonite and gold tellurides. Carbonaceous ores: The gold is fine, and, usually, is predominantly associated with the sulfides (pyrite or arsenopyrite) that are present in carbonaceous ores. Gold in these types of ores is usually recovered by pre-oxidation to dissolve the host sulphides, followed by cyanidation with or without prior concentration by flotation. Some is in the form of colloidal size grains (<0.1 μm) in carbonates or microcrystalline quartz particles (Fleming, 1998). Gold recovery from the carbonaceous sulfidic ore is more difficult because the gold is “robbed” from the cyanide solution by the carbonaceous matter (Wan, 2001). According to the mode of occurrence, gold is classified as three categories: microscopic gold, submicroscopic gold and surface-bound gold (Table 2). Gold minerals in this paper are defined as the minerals in which gold is present as a main constituent (e.g. native gold and electrum). Gold carriers are defined as both the gold mineral and the mineral in or on which gold occurs only in trace amount (such as pyrite and arsenopyrite). Microscopic Gold Microscopic gold, also known as visible gold, comprises gold alloys, gold tellurides, gold sulfides, gold selenides, gold sulfotellurides and gold sulfoselenides etc. Native gold (Au) and electrum (Au, Ag), found in various types of gold deposits, are the two most common and most important gold minerals. Other gold minerals of economic significance in some gold deposits include kustelite (AgAu), auricupride (Cu3Au), tetraauricupride (CuAu), calaverite (AuTe2), krennerite (Au, Ag)Te2), aurostibite (AuSb2) and maldonite (Au2Bi). Microscopic gold in primary ores occurs as pristine grains of varied size and shape in fractures and microfractures, or as attachments to and inclusions in other minerals. Figure 1 presents some common examples of gold occurrences observed in ore and mill products. 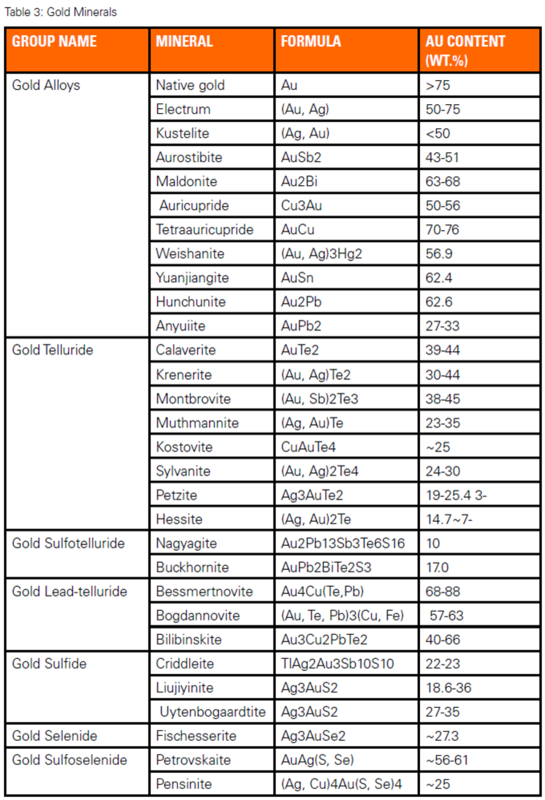 Table 3 lists all gold minerals along with their compositions. • some epithermal gold deposits in South America or Central America like Guatemala at the Motagua zone. Hausen et al., 1986; Wang et al., 1992, 1994). In gold ores, pyrite and arsenopyrite often occur in three morphological types: coarse, porous (blastic) and fine-grained. Framboidal and microcrystalline pyrite are also observed in some gold deposits. Generally, the order of concentration of gold in pyrite and arsenopyrite is: fine-grained>porous>coarse-grained (Figures 8 & 9). In some gold deposits, zoned pyrite contains a high gold concentration, and gold in the outer accretion zone is often higher than that in the core. Gold concentration in pyrite and arsenopyrite ranges from below one ppm to several hundred ppm. Possibly the most Au-rich pyrite was reported from the Emperor gold deposit in Fiji, which contained up to 11,057 ppm Au (Pals et al, 2003). Gold concentrations in arsenopyrite of up to 15,200 ppm have been reported (Chryssoulis et al., 1990). Other submicroscopic gold carriers include chalcopyrite (Cook et al., 1990), loellingite (Neumayr et al., 1993), marcasite, FeOx (in oxidized ores or calcines), realgar and clay minerals (Chao et al., 1987; Wang et al., 1994). Solid solution gold and colloidal gold are the two major forms of submicroscopic gold. gold deposits, zoned pyrite contains a high gold concentration, and gold in the outer accretion zone is often higher than that in the core. Gold concentration in pyrite and arsenopyrite ranges from below one ppm to several hundred ppm. Possibly the most Au-rich pyrite was reported from the Emperor gold deposit in Fiji, which contained up to 11,057 ppm Au (Pals et al, 2003). Gold concentrations in arsenopyrite of up to 15,200 ppm have been reported (Chryssoulis et al., 1990). Other submicroscopic gold carriers include chalcopyrite (Cook et al., 1990), loellingite (Neumayr et al., 1993), marcasite, FeOx (in oxidized ores or calcines), realgar and clay minerals (Chao et al., 1987; Wang et al., 1994). Solid solution gold and colloidal gold are the two major forms of submicroscopic gold. FeOx, stained quartz, carbonaceous matter, clay minerals and wood chips (Table 2). The major mineralogical factors that affect gold extractive metallurgy are discussed briefly below. Gold Grain Size: The grain size of the gold mineral can be a significant factor driving the efficiency of gold recovery processes. Coarse gold may be incompletely leached (or may become trapped upstream of the cyanidation circuit), or not carried by bubbles in flotation. Ultrafine gold is not well recovered by gravity or flotation techniques. When gold is very fine (<10 μm) and associated with sulfide minerals, cyanidation performance may also be poor (Marsden et al., 1992). Encapsulation of visible gold in sulfide and silicate minerals is a common cause for gold losses. Submicroscopic gold, described early, is a significant source of lost gold from many cyanidation operations. The finest grained sulphides usually contain the highest concentrations of solid-solution gold. Consequently, the problem is often exacerbated by poor liberation of the ultra-fine, gold hosted sulphides (Hausen, 1985; Radtke, 1985; Wang et al. 1994; Simon et al., 1999). Coatings and rimmings mainly affect gold extraction by flotation and cyanidation. These coatings and rimmings may be iron oxides or hydroxides (limonite or goethite), which are formed by oxidation, dissolution and precipitation reactions. In addition, sulfide ions react with gold to form insoluble aurous sulphide coatings (Fink et al., 1950). Similar passivation may occur in the presence of thioarsenite and thioantimonite ions (Heldey et al., 1958). Silver in gold minerals. Except occurring as silver minerals, silver in gold oreis often present in electrum, and occasionally in kustelite. 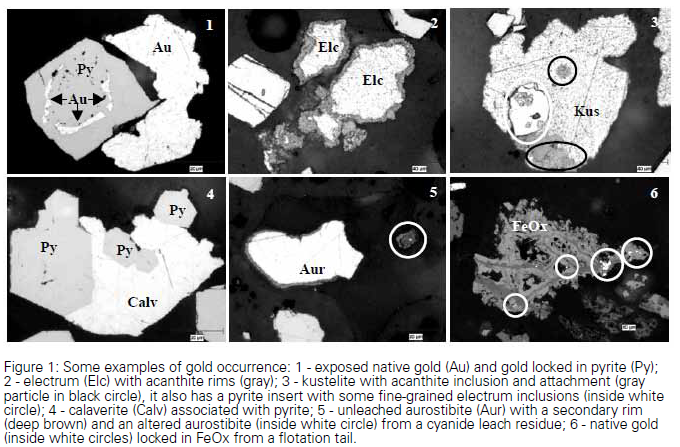 Silver-rich electrum and kustelite tarnish quickly in air, and form a silver sulfide layer of 1-2 μm in thickness in the presence of sulfide ions, which can limit the access of cyanide solution. Such coatings are somewhat hydrophilic, particularly if further oxidation to silver sulfate or silver oxide occurs. This may hamper recovery by flotation (Jilin Institute of Metallurgy, 1978). Gold tellurides, aurostibite and maldonite. Gold tellurides, aurostibite and maldonite are generally considered refractory because of their slowdissolving nature in cyanide solutions. Presence of cyanide and oxygen consumers. Many gold ores contain minerals that react in cyanide solution, consuming oxygen or cyanide or both, and negatively influencing the rate or extent of gold leaching. The most common interfering minerals are the sulfides of iron, arsenic, antimony, copper, zinc and tellurium (Fleming, 1998). REMEMBER, RIO SUERTE DO NOT WORK WITH CHEMICALS, THIS CONTAIN IS ONLY FOR REFERENCE PURPOSES.